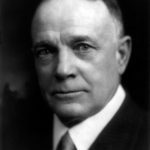 William Ashley Billy Sunday was an American athlete who, after being a popular outfielder in baseball’s National League during the 1880’s, became the most celebrated and influential American evangelist during the first two decades of the 20th century. Converted to evangelical Christianity in the 1880’s, Sunday left baseball for the Christian ministry. He gradually developed his skills as a pulpit evangelist in the Midwest and then, during the early 20th century, he became the nation’s most famous evangelist with his colloquial sermons and frenetic delivery. "I have been, and will go on, fighting that damnable, dirty, rotten business with all the power at my command." "The fellow that has no money is poor. The fellow that has nothing but money is poorer still." "Religion needs a baptism of horse sense." "The trouble with many men is that they have got just enough religion to make them miserable. If there is not joy in religion, you have got a leak in your religion." "Home is the place we love best and grumble the most." "After all is said that can be said upon the liquor traffic, its influence is degrading upon the individual, the family, politics and business, and upon everything that you touch in this old world." "If you don’t do your part, don’t blame God." "God Almighty never intended that the devil should triumph over the Church. He never intended that the saloons should walk rough-shod over Christianity."